Last night while Mike was holding Chloe I snuck up behind him, poked my head over his shoulder and while looking at Chloe said "BOO". Chloe immediately burst into laughter! We continued to do this for 5 more minutes or so and each time Chloe laughed harder then the last which was making Mike and crack up. I love moments like this, when were all together just simply laughing! Last night I was feeling sorda grumpy but hearing my baby's sweet laughter, and seeing the happiness and excitement in her eyes put me in the best mood. It's amazing to me how something as simple as laughter could bring so much joy and happiness to me, how it can completely make me forget why I was even grumpy in the first place! Aw how sweet! I totally know what you mean. Lillian's rare (doesn't happen too often yet!) laughter can always boost my mood! I can't wait till she's laughing all the time!! 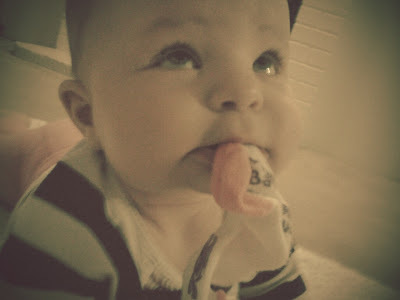 Cute pic of Chloe with the sock! Baby laughs are so amazing! Thanks! 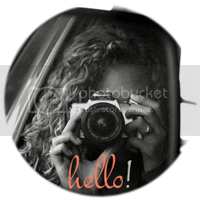 Lindsay, thanks for stopping by and becoming a follower of my blog!